Lawrence's poem 'Figs' is less about eating customs or the botany behind the title's fruit, although both form an intrinsic part of the text, and more about women; or rather about the symbolism of figs which reveals the poet's attitude to female sexuality. Like Nietzsche's truth that, supposed to be a woman, would prefer not to go naked but would insist on being veiled, Lawrence's woman should always keep her mystery secret, unseen and unutterable; flowering inwardly, rejoicing in her covert nakedness. But, whereas for Nietzsche, the veiling of woman-truth signifies that no ultimate truth exists behind the veil, Lawrence sees the veil in different terms, as a force of preservation - of the self, of culture. The female secret exposed, woman bursting into self-assurance, the consequences are fatal: what Lawrence calls 'the flux of death', a state of corruption and dissolution, a voluntary regression to the death-force of the marshes. 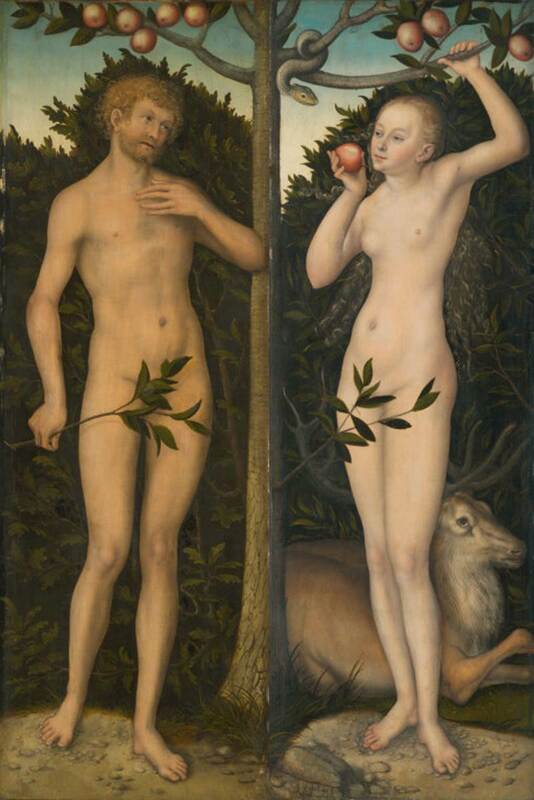 This brings Lawrence's sexual politics, with notions of female wilfulness, into question. He also seems curiously to be forgetting that there is beauty in decay, pleasure in rottenness, and that corruption carries within the seeds of future. September is the most luscious month, stirring auburn leaves in wet soil, breeding conkers and figs out of the mellow air. Ripe figs won't keep, but it's their evanescence that most fascinates me, their crimson affirmation of their own ephemeral existence. A burst fig, a fig that explodes in ripeness is a tantalizing invitation to delight in corruption, in life's mire and blood. 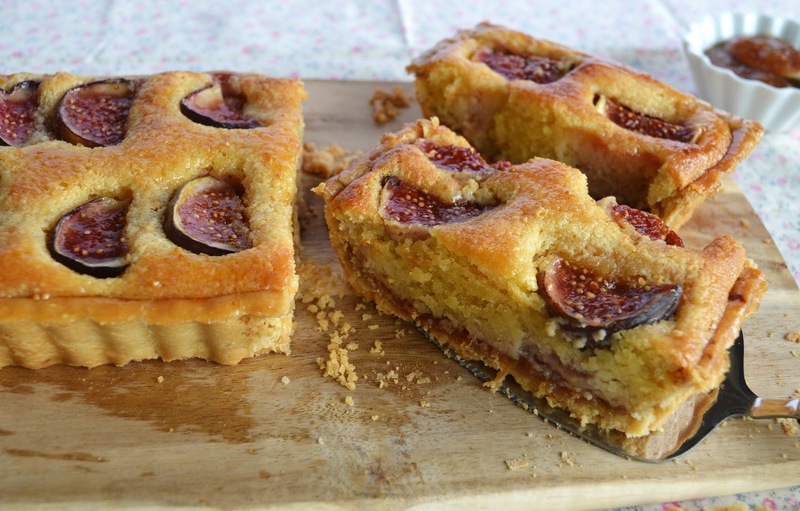 Pairing them with almond in a delicately fragranced crust, this tart is perfect for enjoying the sweet nakedness of figs. Prepare the sweet pastry crust according to directions in the recipe, but substitute 30g ground almonds (or hazelnuts) for an equal amount of flour and add the grated zest of 1 lemon to the dough. Lightly butter and line a 36cm x 12cm rectangular fluted, loose-bottom flan tin with the pastry, prick the bottom with a fork, cover with clingfilm and put back in the fridge for another 30 minutes. To bake blind, cover the sides with foil and place baking parchment on top. Fill this with baking beans and bake on the low er rack of a pre-heated oven at 185 C for 12-15 minutes. Remove the paper and beans, but keep the sides covered with foil, and bake in the oven for a further 5-8 minutes until dry and lightly golden. Remove from the oven and place on a wire rack to cool completely. Once the crust has cooled, heat 4-5 tbsp fig jam with 1 tbsp fig liqueur and 1 tsp lemon juice or water until it melts. Take off the heat and spread the jam over the bottom of the crust. Prepare the frangipane: Using a hand-held mixer, beat the butter and sugar together in a large mixing bowl for about 1 minute, until the mixture is white and fluffy. Gradually add the eggs, beating well after each addition. Add the almond extract and fig liqueur (or vanilla extract), then stir in the ground almonds and self-raising flour until you have a thick paste. If the paste is slightly loose, you can add 5-10g of each ground almonds and self-raising flour. 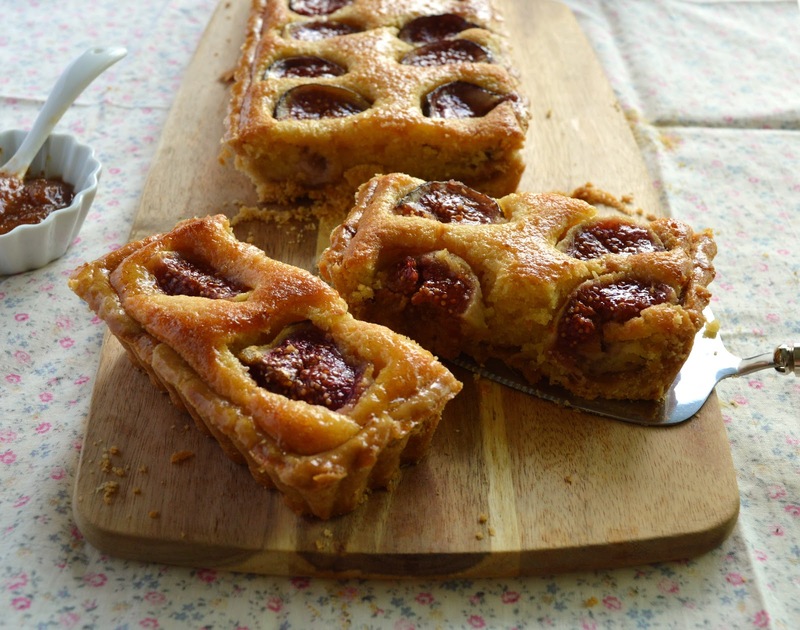 Spoon the frangipane over the biscuit base, spreading it evenly and making sure that it covers the fig jam completely. Carefully place the figs on top, cut side up. Remove the tart from the oven, and while it’s still hot, brush with the apricot glaze. For the glaze: Combine the apricot jam, lemon juice and water in a saucepan and warm over medium low heat until the jam melts. Strain to get rid of the seeds and brush onto the fruit while it's still hot. 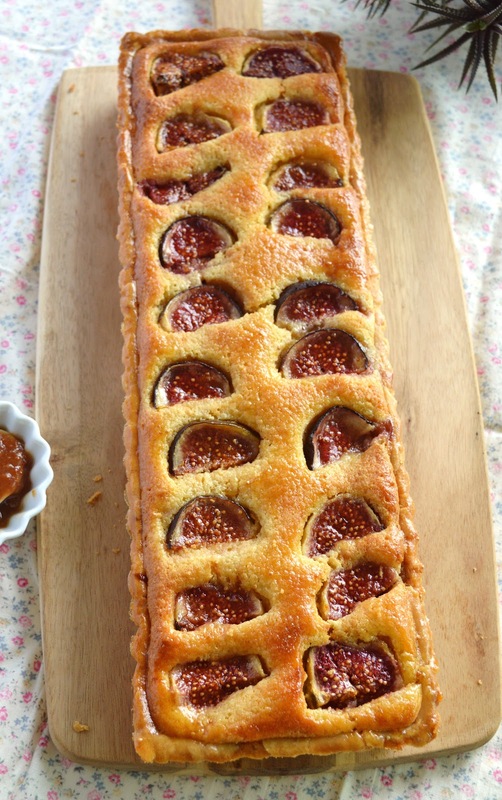 Note: I actually made my own fig jam and fig liqueur for this tart. I thought the jam was very tasty although it came out slightly thick, but I found my fig liqueur was far superior to the commercial brand, mainly because it was more potent and not as sweet. I'm interested in this homemade fig liqueur! Did you steep figs in vodka à la homemade vanilla extract, or is there a more complex method? Hi Hannah. Thanks for visiting my blog and huge apologies for the delayed response. I've been away in the mountains with no internet access. I made the liqueur a long time ago and had to go back to my scrappy notes, but there's nothing complex about it. Here's the recipe: I chopped 1 1/2 pound dried figs and placed them in a jar with 3 cups high proof vodka (I measured 750 ml) - the ratio is 1 pound dried figs for every 2 cups of vodka. The fruit must be completely immersed in the vodka. I sealed the jar (I believe I sterilised it first) and left it for 2 weeks and 3 days, shaking occasionally. Then I strained the contents and discarded the figs. I prepared the syrup by boiling equal amounts of sugar and water, i.e. 1 cup of each but used less than 1/4 cup because I didn't want the liqueur too sweet. You can certainly adjust to taste. Some recipes call for the figs to be reconstituted in boiling water but I ended up with some pretty unsightly and mushy fruit and had to start all over again. 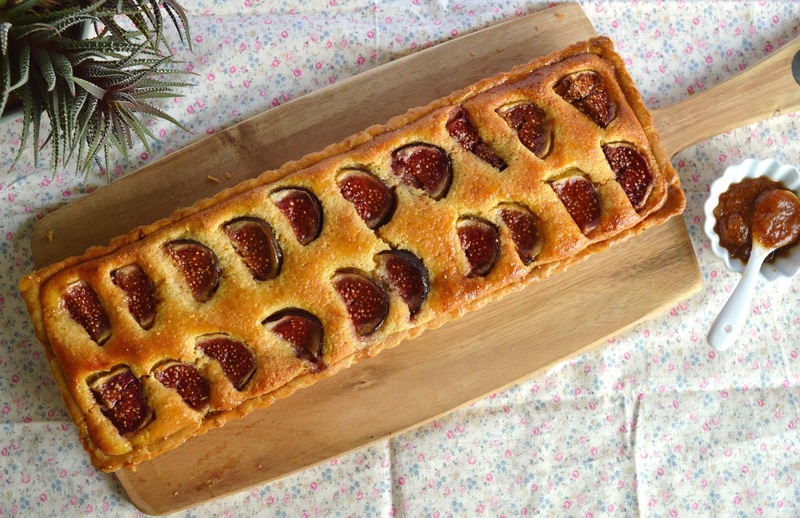 I also tried to make it with fresh figs, but that didn't work either. 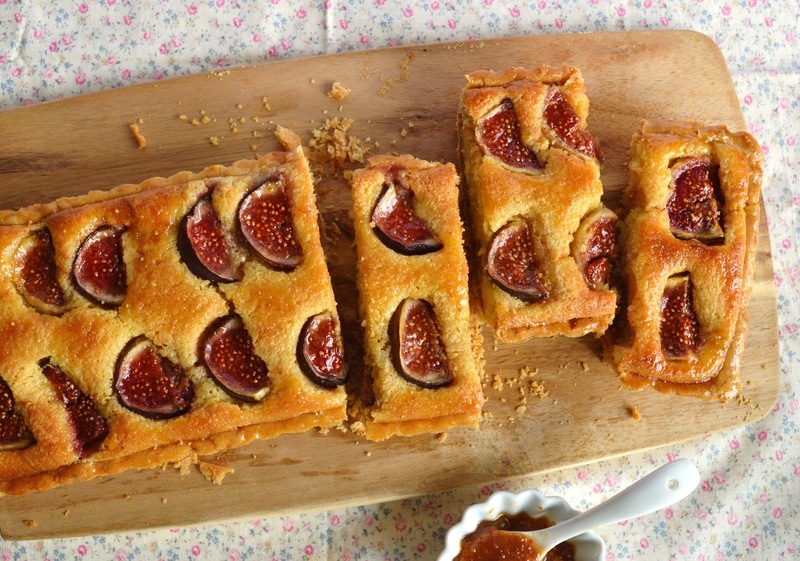 I think it's best with dried figs, which is great because you can make it all year round. I hope you try it and enjoy it!